40,257 possible formulas, 1 unique formula for you. 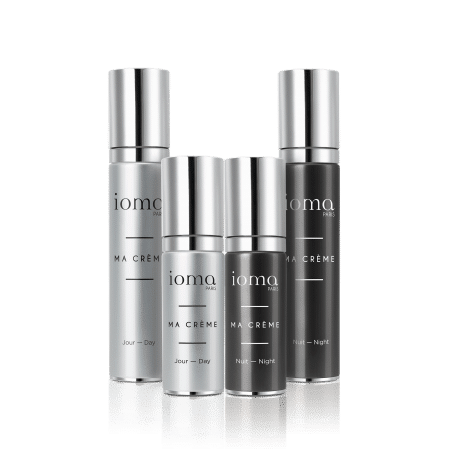 Your bespoke skincare ready in 1 minute thanks to the IOMA In.Lab technology. Now also available in 30ml/1,0 FL.OZ. Available in 30ml/1,0 FL.OZ. and 50ml/1,69 FL.OZ. In.novation comes from In.spiration… In.vention comes from In.genuity… Custom made is In.dispensable… Customization is In.finite! Discover IOMA In.Lab, a gem of technology at the service of tailor-made cosmetics. «We have come to miniaturize the genius…» Go behind the scenes of the creation of IOMA In.Lab told in detail by Jean Michel Karam, founder and CEO of IOMA. Your skin evolves over time; you need a custom-made formula to meet your real skin needs. Day after day, the result is visible on the only skin that counts for us: yours! MA CREME is two bases: day and night, concentrated in active principles to adapt to the chronobiology of the skin. These two unique Active Bases contain NEUTRAZEN, a highly effective peptide that reduces the sensitivity of the skin, and VITAMIN E, which protects the skin from free radicals and prevents skin aging.Aqueous, silicone-free, mineral-free, the base diffuses the active principles in an efficient and homogeneous way. contains 18 different active principles and 10,5% of active principles in total. It's objective ? Focuses on hydration and protection thanks to its cocktail of moisturizing and anti radicals. The most : its ultra-fluid texture for fast penetration. contains 18 different active principles and 13.8% of active principles in total. It's objective ? Focuses on anti-aging thanks to its active anti-wrinkle and firmness cocktail. The most : its creamy texture, for a pleasant application. Each Active base is capable of hosting each of the 8 serums, at the appropriate dosage, and further maximizing its effectiveness . Thus, with active bases and added sera, once formulated, MA CREME contains up to 21% of active ingredients! It is a true concentration of care! MA CREME is one application per day, two pumps for the whole face and neck 12 to 15 weeks of treatment. 8 bottles of Serum, concentrates of active ingredients aiming to change your skin’s present and future. The 8 Serums provide a high concentration of active ingredients which are complementary, acting in synergy and with precision on each individual's skin. - 3 Serums with a powerful hydrating action. - 5 Serums with multiple rejuvenating/antiaging benefits. 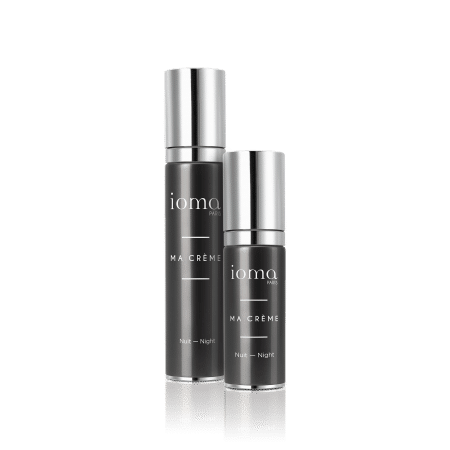 IOMA has defined to 40,257 formulas for the personalized cosmetic care MA CREME . This large number of formulas was established analyzing information from the IOMA skin Atlas, a database of more than 1 million diagnoses. 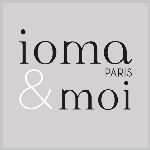 Today, IOMA has succeeded in going even further in personalized cosmetics with IOMA In.Lab! IOMA In.Lab delivers excellence to every individual based on unprecedented state-of-the-art technology. MA CREME was awarded the Grand Innovation Award 2015 by readers of the Advantages magazine.